In my journey I had to find promises from God to hold on to. These words became my prayer and my song. And they still are. God gave David protection and deliverance – and I choose to trust and believe that He will do the same for you and me! David spoke to the Lord the words of this song on the day when the Lord delivered him from the hands of all his enemies and from the hand of Saul. 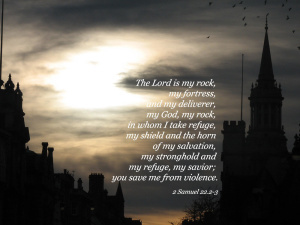 My God, my Rock, in Him will I take refuge; my Shield and the Horn of my salvation; my Stronghold and my Refuge, my Savior—You save me from violence. Posted in Activism, faith, God, Healing, Hope, Religion and Spirituality, Spirituality and tagged deaths, Deliverance, Divine protection, Evil, God's protection, Orlando, prayers, protectioin, violence. Bookmark the permalink.